Fact: my babies are notoriously cozy in utero and I dare say too cozy. 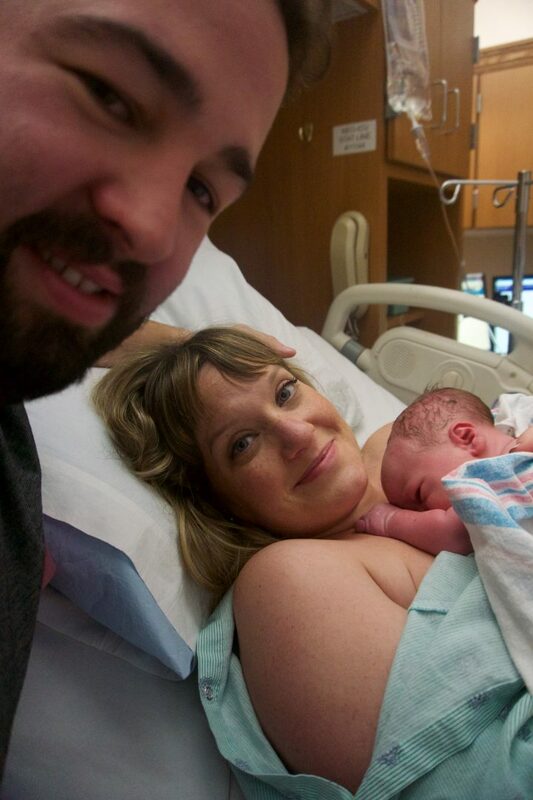 Our daughter, Annie, finally made her appearance six days after her due date but I reasoned she was our first so our second would come on time, maybe even early. Valid reasoning, right? 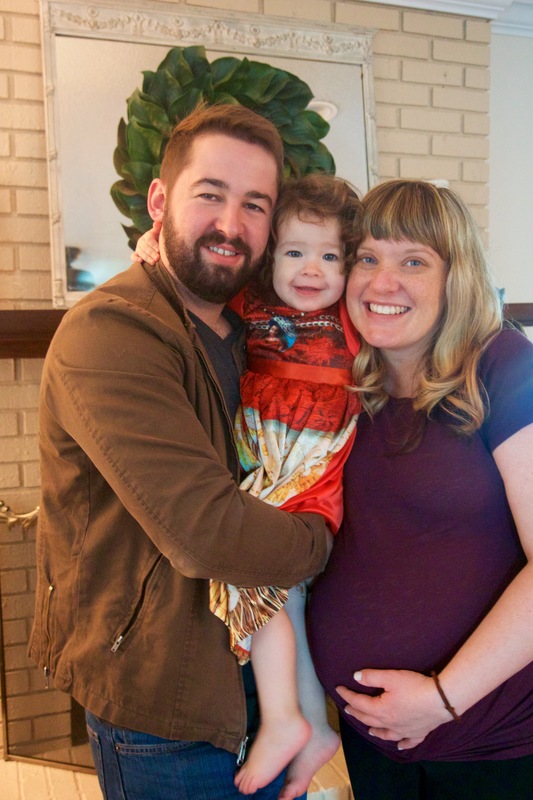 I will never forget the look on my midwife’s face at our Dec. 29th due date appointment when she said – he’s not ready. She advised that we reevaluate in a week and try to rest in the meantime. Waiting for a baby to arrive is like waiting for Santa to arrive except you’re not sure when he’ll actually show up and you can’t stop eating all the cookies. To make matters even funnier, our two year old daughter and soon to be big sis, Annie, kept asking us why Santa didn’t bring her baby brother along with her play kitchen. I kept telling her he would be here soon and I tried to believe what I was saying but my patience was waning. I was ginormous, exhausted from not sleeping much at night, sluggish from eating all the holiday treats, and starting to think I would, in fact, be pregnant forever. Friends and family predicted he would be a New Years Day baby but that came and went and all the holiday decor I just had to have up by Thanksgiving (just in case he came early!!) was packed nicely away in the attic. 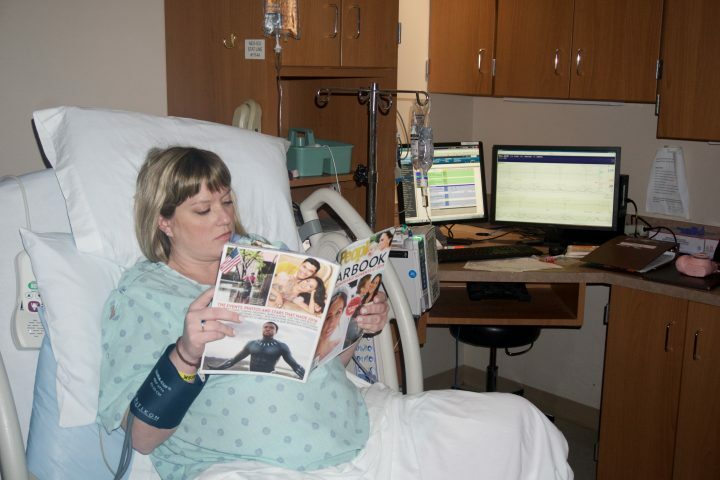 At 41 weeks and 2 days we went in for a stress test where essentially I laid back in a big comfy chair and listened to some tunes while they track baby’s heartbeat and any contractions I was having. 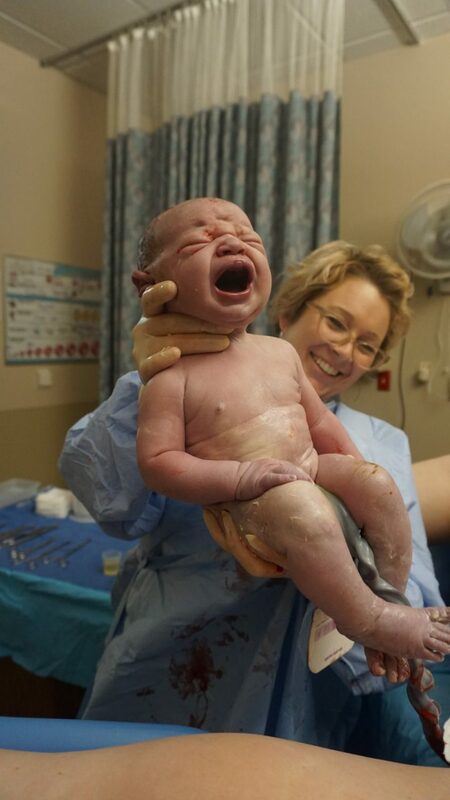 I started feeling some mild contractions and was confident he was coming within a few hours but when my midwife walked in, her face said it all. He was healthy, happy and perfectly cozy. He hadn’t dropped (le sigh) but all his vitals and mine were perfect (WIN). Our new plan of action? We would induce the next night and would have our baby on Wednesday – it was time to smoke him out! We had induced with our daughter and had a smooth experience so I was a little more prepared, but still a little nervous. We had a plan and would meet our baby boy soon! Tuesday night we ate my favorite pizza in the city then left Annie in the capable hands of my parents so we could head to the hospital to start the induction process. We were shown to our room and soon I was in the glamorous hospital gown and chatting with the nurse as she filled out our paperwork. Since I was barely dilated or effaced, she gave me something to help kick my body into high gear but warned me it might be a slow process and to try and rest during the night. Taylor pulled his chair bed right beside my hospital bed and we watched the “birth episodes” of Friends – some of my favorites – and then watched The Proposal. I dozed for a little bit and then noticed contractions were starting, mild at first and then building. After an hour or so they were getting intense, painful even, and I woke Taylor up to hold my hand. He reminded me to breathe and he prayed the sweetest prayer over us, our baby and over each contraction that was bringing him to the light. But for real, contractions hurt. The next morning we met our incredible nurse with the big smile, Karen, and I loved her from the start. She checked me and was shocked that I hadn’t ask for any pain meds during the night because I was fully effaced and dilated to a 4. I was in shock but relieved to hear my pain had served a big purpose and that my body had remembered what to do. Karen shared in my excitement and told me I could take a shower before they gave me my epidural. With the help of my incredible husband, I took a shower, brushed my hair and put on some bronzer and mascara between leaning over the sink and breathing through contractions. I returned to my bed feeling refreshed and ready to get the show on the road. Taylor was then kicked out of the room so the super nice anesthesiologist could make all my dreams come true with the epidural. As excited as I was to not feel every contraction I was still a little nervous about the giant needle, so thankfully Karen talked me through it as I clutched my pillow tight. I was shocked how quickly the medicine took effect and was enormously relieved that part was over. Hannah, my midwife who I am borderline obsessed with, came by to say hi and break my water. She is seriously incredible at her job and just a super fun human – and she made me feel at ease with the whole situation. She cheered, “we’re having a baby today” as she left the room and it made me love her even more. My parents arrived soon after with reading material and were amazed I was progressing so quickly. 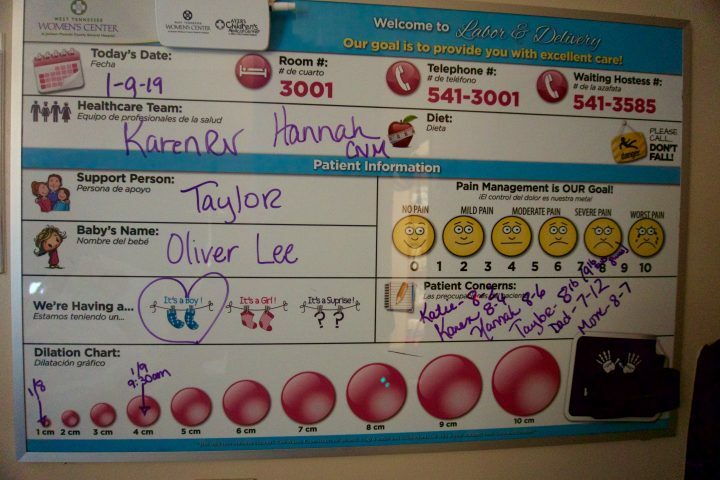 Taylor filled them in on what had happened pre-epidural and I enjoyed a couple popsicles. Karen came in and moved me around on the peanut, my first time using that contraption, to try and coax Ollie down since he was still just hanging out super high. We all guessed how big he would be and she wrote it on the white board, the biggest weight being 8 lbs until Taylor decided to change his guess to a whopping 9lbs. She upped my Pitocin and predicted he would arrive around lunch – I was thrilled! Lunch came and went and still no sign of pushing anytime soon. I was dilating, sure, just not as speedy as before. I was starving and exhausted from not sleeping much the night before. My optimism was waning for sure. I told Karen I thought he was kicking off my rib cage because it was hurting, no matter how I propped myself up or laid. She told us maybe he was a little bigger than we had predicted. Around 4pm, Hannah came in to check on me and I broke down. I didn’t understand why my body was taking so long and I feared something was wrong. Through the tears I asked her if this meant a c-section . I knew she would be honest with me. Hannah held my hand as I cried and told me nothing was wrong, it was just taking longer than we had hoped but she wasn’t scared at all. She knew my body would keep doing what it was supposed to do and Ollie would arrive soon. She said I needed to get to this point – the I AM SO DONE WITH THIS point – to be truly ready to push. She told me to rest and that she would be back when I was fully dilated. Taylor took my hands and prayed the sweetest prayer for us, and those pep talks were all the encouragement I needed. I watched HGTV and rested my eyes. One hour later and it was time. Hannah came in, told me I was a full 10 cm dilated, and asked if I was ready to start pushing. OF COURSE I was ready! 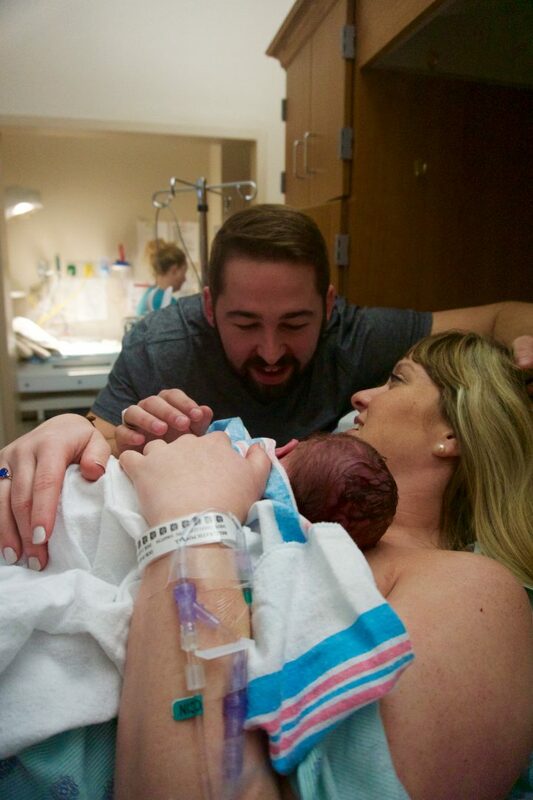 It was such a surreal moment – I had been praying and waiting on this moment for almost 42 weeks and then all of a sudden it felt like no time at all. Could I do this? Would I remember how to push? Would I have to push for 2+ hours like I had with my first baby? My mom came in to check on us, not realizing it was time to push, and I asked her to stay with us. Hannah let Taylor help her set out all the tools and everything needed for delivery – a deal they had made at one of our weekly appointments – and Karen got the bed in the right position. Mom held my hand and I silently prayed for strength. The room was so calm. No bright lights. No loud voices. HGTV was on mute. Hannah had me do a test push or two while Taylor held my hand. Deep breath in, hold and push push push push. Rest. Deep breath in, hold and push push push PUSH. By the third push it had come back to me, how to effectively push, and Hannah said he was coming fast. I felt tremendous pressure as Ollie was no doubt kicking off my ribs as he made his way to the light as Mom said. Everyone was cheering me on with each contraction and I was in the zone. Two pushes later and as I was recovering from pushing Hannah asked if I wanted to pull him out the rest of the way. I’m sorry what? It had only been 15 minutes! I barely had time to compute what she had asked before I saw my baby. Hannah was holding him, not yet crying, and he was perfect. He had come out Superman style, punching one arm out before his shoulders followed. Bigger than expected with a little hair and the chunkiest of cheeks. Hannah laid him on my chest and Taylor kissed me and Mom, who never cries, was sobbing beside me. I looked into Ollie’s eyes and couldn’t hold back tears of pure joy and relief. He was finally here! Taylor cut the umbilical cord and we heard the sweetest baby cries. Karen placed Ollie on the scale and shouted out (to Taylor’s delight) that he was a whopping nine pounds! No wonder I was so uncomfortable but of course none of that mattered anymore. Hannah brought us two ice cold Coca Colas and we all talked about what an incredible experience bringing a baby into the world is and how God is so so good. 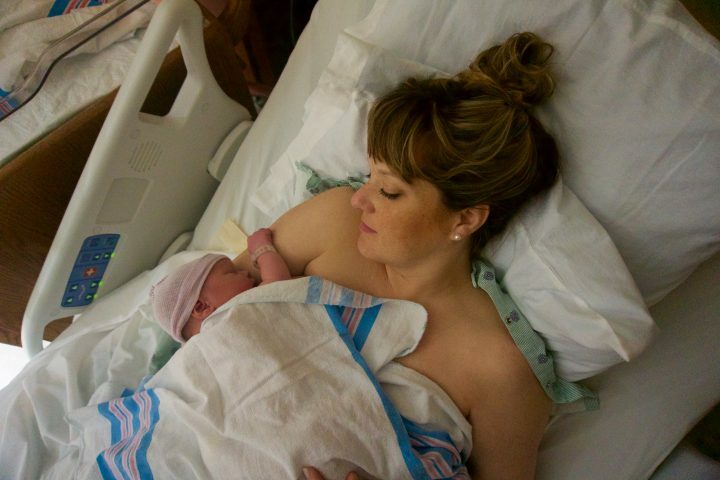 I thanked Hannah for walking with us every step of the way and for such an intimate, chill labor and delivery. Always my cheerleader, she told me I did a great job and how much she loved us. Ollie looked up at me before latching and I felt the deepest sense of peace. God brought him into this world in His timing and all was right with the world. Soon his big sister and our friends and family would come meet him but for now, it was just us. And it was perfect.